November 4, 2018, at hospital, late of Springwell Crescent, Groomsport, dearly loved husband of the late Jean and much-loved brother of Carl. Service in Roselawn Crematorium on Thursday at 4.30 p.m.
Family flowers only please. 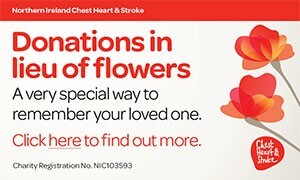 Donations may be sent, if desired, to the Salvation Army c/o S. Clarke & Son, Funeral Directors, 64 Newtownards Road, Bangor, BT20 4DR. Will be sadly missed and lovingly remembered by all the family circle at home and abroad. I am sorry to tell you that Ronald (Ronnie) WHITESIDE has passed away.